Thank you GrabAGun for the great price and fast delivery; you’re always my first stop when purchasing. I had some a lot of failure to eject problems with Fiocchi 115GR FMJ on break-in. I had no problems with Speer Lawman 147 GR TMJ so, I hope this helps out a new buyer. I only shot it with a Kaw Valley Precision 9MM 1/2x28 Black Oxide Linear Comp installed; I cannot provide data presently with the thread protector installed. I’ll try to update this review after my next trip to the range; I’ll try the same Fiocchi 115GR FMJ ammo and report if there’s an improvement. I found my Walther PPQ M2 Navy 9mm 4.6-inch with threaded barrel is incredibly accurate. It’s very balanced and muzzle flip is comparable to any 9mm its size. I was able to successfully accomplish the 5x5 drill, i.e., five rounds shot in five seconds from five yards at a five-inch circle. It can’t be any simpler to break down and the backstraps are a breeze to swap-out to fit your hand size. As most of you probably already know, PPQ’s have superior triggers; it’s well documented fact and I wholeheartedly concur. PPQ M2 Navy 9mm with a Kaw Valley Precision 9MM 1/2x28 Black Oxide Linear Comp installed. I love this gun. The first thing I did was field strip and clean it than I put two hundred rounds through it. The gun functioned flawlessly. I still need to get a suppressor for it but I did go ahead and get a laser flashlight adapter for the rail. Get this candy will not be disappointed. First of all Grabagun lives up to all its positive reviews regarding prices and dependability with delivery. I live in Indiana. I placed the order on a Friday morning and the gun was delivered to my FFL and in my hands at noon the following Wednesday. The gun itself is a dream to shoot. I have large hands and most guns feel small and unsecured when firing. Not the Walther. It fits my hands perfectly even with the smallest backstrap. Of the three supplied backstraps the medium size fits and feels the best. I went to the range and put all 100 rounds into the target at 20 yards, and I am by no means an expert marksman! Recoil is minimal and the trigger pull and reset are both the best of any handgun I've ever shot. Grabagun and the Walther PPQ M2 Navy both live up to their hype! Not disappointed with this weapon at all. Have put about 200 rounds through it and what a fabulous trigger! 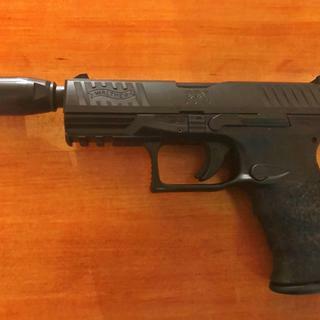 Not a single malfunction of any kind and quite happy with this Navy version of the PPQ. I was never a fan of striker fired guns. I was a Sig person, liked the exposed hammer. A friend let me shoot his PPQ. I fell in love with it, hard. This is the best striker fired gun I have ever shot. The trigger is fantastic. I quit carrying my P229 and this is my preferred carry gun. I also shoot better it, probably the trigger. You will not be sorry you bought it. Worth the Walther premium cost. I only wish it also came in a single stack, compact version. If they ever do, I'm on it. I just received this weapon and have not shot it yet, but initial reaction: Great fit and finish and outstanding fit in my hand. Grab A Gun pulled through, as usual, exactly as promised. This is my third purchase from them and will buy again from this quality outfit. I bought this for a friend to complement my 1st edition PPQ. We weren't disappointed. Quality is great. Fit is adjustable and it fits him perfectly. I expect it to be the same tack hammer that my PPQ is. Walther, you've done it again! Tenifer-coated slide and 4.6" threaded barrel.